‘Shark Tank’/ABCMark Cuban holds up his personalised illustration from the creator of I Want to Draw a Cat for You. 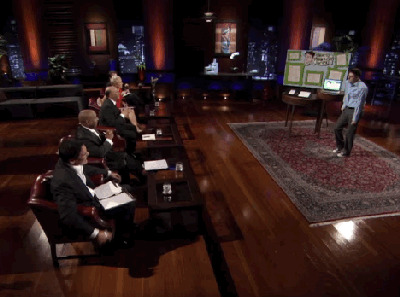 From a Bluetooth device surgically implanted into your ear to a massive generator that creates “hurricanes” that produce energy and gold, the investors on “Shark Tank” have heard some strange pitches over the past six seasons. At the end of the recently aired 100th episode of the hit pitch show on ABC, Sharks Mark Cuban, Daymond John, Barbara Corcoran, Kevin O’Leary, Lori Greiner, and Robert Herjavec get together to reminisce about their favourite moments from the show. Greiner asks the group what their favourite pitches were, and instead of going with what they considered to be the best, they all decide to talk about the ones they found the most ridiculous. We’ve summarized the eight craziest pitches they mentioned, and you’ll quickly see why the Sharks find them so memorable. The Ionic Ear sets a high bar for crazy in the very first episode. The Sharks agree that a pitch from the pilot episode has remained the most ridiculous. Darren Johnson seeks $US1 million for a 15% stake in his company Ionic Ear. 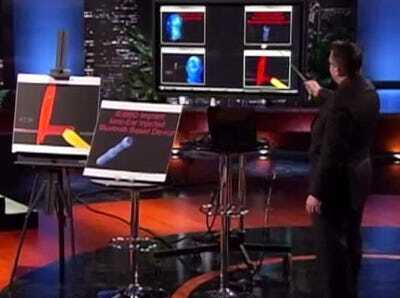 His pitch: Your Bluetooth earpiece moves around too much (this was 2009), which interferes with calls. So why not have the same technology surgically implanted into your ear canal? And at the end of each day, you insert a Q-Tip-like charger into your ear to charge the device. Johnson is humorless and doesn't prove his qualifications. There will likely be a time where implanted technology is a thing, but the Ionic Ear isn't going to be a pioneer. Throx is based entirely on selling three socks at once. Edwin Heaven, an entrepreneur who both sounds and looks like a Vegas magician, enters the tank in season one looking for $US50,000 for 25% equity. His company Throx produces socks that are sold three at a time, so that you'll always have an extra sock after you lose one of them. There's nothing extraordinary about the sock quality, but hey, you get three in each pack. The Sharks don't see it as a real business opportunity, and O'Leary even lets Heaven know that he considers him a 'vampire cockroach.' Yikes. Things escalate quickly with the Carsik Bib. Les Cookson is a dad with a couple of young boys who apparently have very little control over their stomachs. 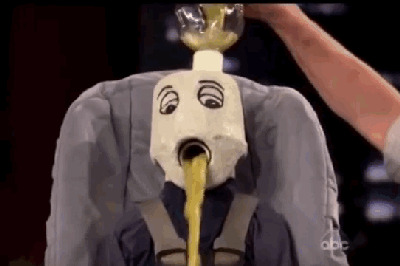 He invented the Carsik Bib, essentially a barf bag worn as a bib designed for kids in car seats. In season two, he seeks $US30,000 for 15% equity. Almost immediately after introducing himself and the issue of carsick kids, he turns to his crudely made child-size dummy and pours a vile blend of pea soup and corn through the dummy's head, splashing everywhere. The Sharks may have enjoyed the demonstration, but they don't see a viable business plan. 'If I actually gave you 30 grand, I would throw up in this thing,' O'Leary tells Cookson. Wake 'N' Bacon takes waking up to the smell of breakfast to a new level. Matty Sallin enters the tank in season two in 2011, around the height of the bacon craze in the US. 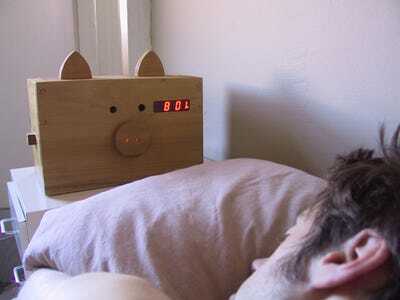 He comes to the Sharks looking for $US40,000 for 20% of his company Wake 'N' Bacon, which makes a wooden alarm clock that broils bacon set to the time you wake up. Sallin not only doesn't know basics like the cost of production, but the clock poses a serious fire hazard. And on top of that, the Sharks point out, the novelty would eventually wear thin for many bacon fans whose rooms develop a permanent aroma of grease. Mark Sullivan thinks he's found the secret to both renewable energy and gold production. Sullivan has been the only entrepreneur to promise the Sharks a share of $US96 billion in profit. 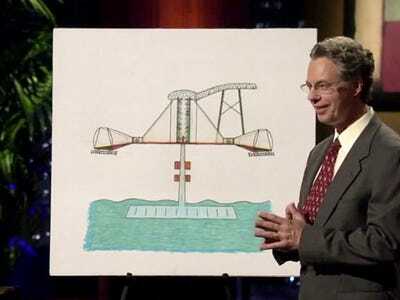 In season three, Sullivan presents the investors with a series of illustrations for the Sullivan Generator and asks for $US1 million for 10% equity. Sullivan's massive generators would be scattered across the world, pulling in massive amounts of ocean water to create contained hurricanes for electricity production. Gold is a byproduct that can be collected and turned into currency, he says. It's hard to tell if Sullivan is a classic snake oil salesman or simply daft, but the absurdity of the invention is too much for the Sharks. Steve Gadlin really wants to draw a cat for you. This is a success story that came out of a silly pitch. In season three, Gadlin enters the tank and gives an absurd song-and-dance number about how he wants to draw a cat for you, as part of his business I Want to Draw a Cat for You. The Sharks love it, and Gadlin differentiates himself from others in this list because he's totally self-aware. Gadlin offers customised cat drawings and merchandise starting at $US9.95 through his website. 'There's an economy of stupid, and I am overflowing with it,' Gadlin says. He seeks $US10,000 for 25%, and Mark Cuban proposes $US25,000 for 30%, which Gadlin accepts. CNBC reports that Gadlin made $US200,000 in revenue in the year following his appearance. Freaker USA's founder is too freaky for the Sharks. In season four, Zach Crain enters the tank with a somersault and gives a pitch filled with weird noises and gestures. Though Crain embraces his wacky personality, he actually has a viable product. Freaker USA makes hand-knit liquor- and wine-bottle wraps that can make your party less messy -- think a larger, artsy bottle koozie. Crain had one of 2011's top Kickstarter campaigns and raised $US60,000. He wants $US200,000 for a 10% stake. Most of the Sharks love Crain, but don't see themselves growing the company. Cuban actually has the opposite conclusion; Crain's antics are too much for him. Ryan 'Cowboy' Ehmann enters the tank in season four complete with cowboy hat, rodeo pants, and a muscular, bare chest. 'Woo hoo, that's what I'm talkin' about!' he hollers. Ehmann is a former rodeo cowboy looking for $US120,000 for 25% in his Lose 12 Inches fitness brand. There may be nothing revolutionary about his fitness regimens, but John, a CrossFit gym owner, thinks that Ehmann's personality and passion is worth the full investment. He gives Ehmann the deal he's looking for.